Luke Dončić has played seven NBA games in his career, and his passing is already sufficiently respected and feared by opponents to the point that he was able to create a wide open shot for himself with a fake no-look pass last night. Dončić’s Mavericks lost in San Antonio last night, although Dončić had the best game of his young career, waggling his way to 31 points, eight boards, and four dimes. The 19-year-old Slovenian can very clearly score at the NBA level, and is already an above average three-point shooter, canning four last night and taking seven per game. What’s been most surprising about his adjustment is how easy it all looks for him and how unworried he appears to be about all of it—if you’re just joining us, he attempted a fake no-look pass in his seventh NBA game. 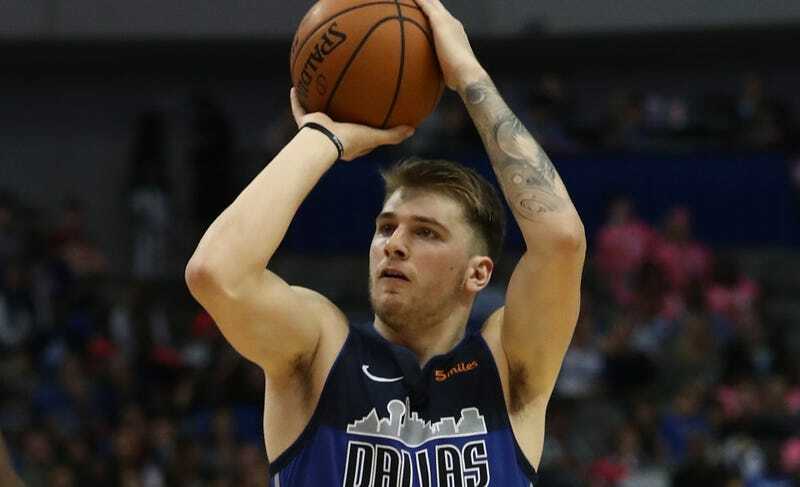 Dončić can create for his teammates as readily as he creates for himself, and the Mavericks already look like his team. He’s leading Dallas with 20.4 points, 35.7 minutes, 15.7 shots, and 4.7 free throws per game. It’s not nearly the sexiest part of his game, but what defines Dončić the best at this point is his vision. He’s only just started playing with DeAndre Jordan and he already seems to know where he’ll be standing. This may not look that hard, given that Jordan is a big target and has been finishing plays like this for going on a decade, but here’s a really nifty little pocket pass through a rotating defense. Dončić waits just long enough to make LaMarcus Aldridge guess wrong, and then he delivers. “Atheleticism” in NBA players tends to get discussed in Westbrookian terms, probably because that’s how it is most visible—how high can you jump, how explosive of a first step do you have. Dončić doesn’t check those boxes exactly, but he’s an impressive athlete nonetheless. His balance and body control are obviously at a very high level, and he everything he does looks smooth enough to win him an A on any possible eye test. There are no hitches or tells in his game, and already there’s no hesitation. When I watched his full highlight reel from the game, I was struck by how simple everything looked for him. That little floater in particular looks like a shot he’ll be able to take basically whenever he wants to. Anyway, I hope we get to see Dončić and Dirk Nowitzki run some extremely silly pick-and-rolls this year.